He served Indian cricket with distinction for 16 years, scoring over 10000 runs in both forms of the game he played and scripting several match-winning knocks for his country. Rahul Dravid might have got used to this in his career. He was a silent achiever for his country, a man who never got the limelight he deserved. He scored a magnificent 153* against New Zealand in an ODI in 1999, but this innings was drowned by the euphoria surrounding the 186* that Tendulkar scored in the same game. He scored a stunning 180 against Australia in the famous Eden Gardens Test in 2001, but this too was drowned by the wizardry from the willow of a man called VVS Laxman, who scored a breath-taking 281. Dravid was probably born in the wrong era - for, he played out his entire career under the giant shadow cast by a Genius called Sachin Tendulkar. And, both these batsmen could not have been more different. Tendulkar was a master - a man who was almost touched by an invisible hand from above. His ability to make the most difficult of shots look ridiculously easy set him apart from the rest. 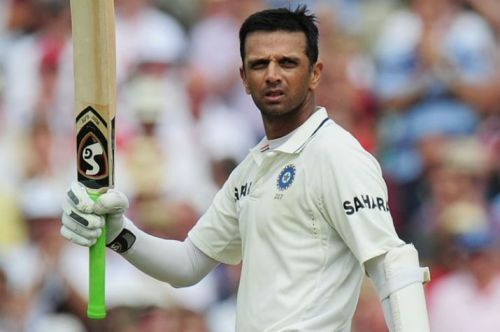 Dravid, on the other hand, represented the essential human qualities needed to succeed in life - determination, endurance, patience and perseverance. He was a man who showed us that dedication and sincerity towards your profession can take you to great heights in life. But, more than anything else, Dravid was the quintessential team man - An opener injured? No problem. Dravid will step up. The team needs a batsman who also has to double up as a wicket keeper? Again, no problem. Dravid will step up. It might have taken so much out of him, it might have thrown him out of his comfort zone, but he hardly complained. But of course, during the course of his remarkable career, Dravid did have some of his moments. His magnificent 233 against Australia at Adelaide in 2003 enabled India to register its first Test win in Australia after two decades. His magnificent 270 against Pakistan at Rawalpindi was one for the connoisseurs of Test cricket. In a classic display of pure batsmanship, Dravid flattened the Pakistani bowling attack with classic square cuts and pristine flicks. Dravid bowed out of the game in 2012. Impeccably dressed in a suit and a tie, he gave a small press conference, posed for a few obligatory photographs, and he was gone. Just contrast that with the kind of farewell that Tendulkar received - the whole of India coming to a standstill, the Govt. of India releasing a stamp in his honor to commemorate the maestro’s 200th Test, grown men and women weeping like children as Tendulkar delivered his 20 minute farewell speech in front of his adoring fans. Dravid was a hero who never got his due. But, he never complained. Ah! What a gentleman of the game.